For some bands, the third record is usually the most difficult to write. Whether it’s because of a lack of creativity, or a fear of disappointing a fanbase built steadily up over the course of two albums, the third album is usually the most difficult record to produce. 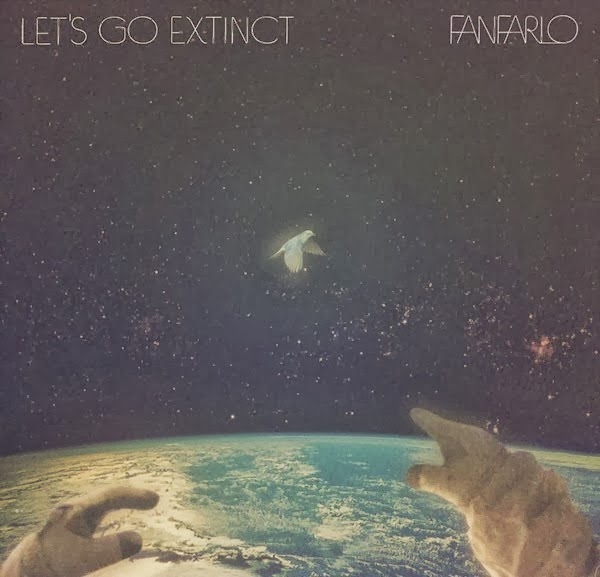 In some cases the third album could be their most celebrated (QOTSA), or could be their most hated (Arctic Monkeys…despite Humbug being extremely good), but this is definitely not the case with Fanfarlo’s newest output Let’s Go Extinct. Let’s Get Extinct sees Fanfarlo return to their roots as they bring some disco/pop elements back into their sound reminiscent of their debut Reservoir, which were scrapped somewhat in favour of the strong focus on all things atmosphere for second album (Rooms Filled With Light). This new album could be considered a concept as the band tackle the idea of human evolution and possible future, but then that is pretty much a concept we all tend to go through everyday, and Fanfarlo have decided to let loose and pack all of these depression-inducing topics with as much fun as possible for what is easily their best record yet. Life In The Sky kicks things off with six minutes of pure pop utopia. It fully utilises Fanfarlo’s knack for creating vast atmospheres by incorporating all kinds of percussion and synths which are allowed to meander throughout the airwaves, and are backed up with various guitar licks that add a little thickness to the track. The main drive of this song however are the vocals, which whether accompanied by female vocals or stand alone, are given the perfect amount of reverb to make things sound even more grandiose. Life In The Sky pretty much delivers everything the listener should expect from Let’s Go Extinct, making it easy to get hyped for what’s to come. Excellent song. This wave of blissful wonderment continues as Cell Song rides the pop genre with some dreamy piano keys and light guitar strums coming together to form a simply divine sound. The echo-y vocals once again broaden the scope as the song only maintains the bubble of cloud nine that Fanfarlo formed around the listener’s head right at the start of Let’s Go Extinct, and I’m pleased to say that it remains that throughout the remainder of this wonderful album. Lead single Landlocked features everything that makes a great single a great freakin’ single. There’s all kinds of upbeat synths and guitar riffs and even a killer lead riff that delicately gets into the listener’s head and politely stays there for the rest of the day. It’s wonderful. Honestly it’s hard to not appreciate everything around yourself while this record plays. It’s as if Let’s Go Extinctenters the head and covers all the bad thoughts in this thick gloop of rainbow-coloured medicine and diminishes it until it’s gone for good. I’m writing this at 12am right now, and I’m clearly a little sleep deprived, but this record just makes me so happy. I love it. So good. For more music reviews, free downloads and I’ll have what he’s having check out Exploding Head Syndrome on Facebook and Twitter.